UD's April Kloxin has been awarded a National Science Foundation Career Award to study signals that regulate tissue stability, disease and repair in the body. 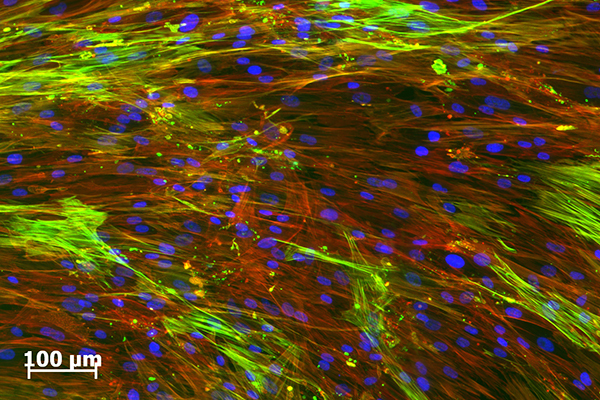 In response the cues or signals outside of the cell, lung fibroblasts (blue nuclei) activate into a wound healing state (noted by green stress fibers) and form highly organized, contractile cytoskeletons (red plus green fibers). In response the cues or signals outside of the cell, lung fibroblasts (blue nuclei) activate into a wound healing state and form highly organized, contractile cytoskeletons (noted by green stress fibers). 1:14 p.m., April 2, 2013--April Kloxin, assistant professor of chemical and biomolecular engineering at the University of Delaware, has been awarded a $500,000 National Science Foundation (NSF) Faculty Early Career Development Award to study the extracellular signals that regulate tissue stability, disease and repair in the body. According to Kloxin, understanding the complex interplay between cells and their external environment is an essential part of designing therapeutic approaches to prevent the progression of disease or to direct tissue regeneration. “Biomimetic materials  materials that mimic the biology of natural tissue  have emerged as a key tool in understanding the role of extracellular signals in cell behavior,” she said. Creating biomaterials that fully capture these intricate communications between cells and their environment, however, remains elusive. Cancer cells, for example, seem to have the innate ability to turn on and off, but it is unknown whether this switch is in response to a particular signal the cell receives, or due to some other cause. Kloxin will focus her research on pulmonary fibroblasts. Fibroblasts are cells that naturally occur within all parts of the body. They produce collagen, which is organized into fibers, and become activated when repair is required. For example, when a person sustains a cut on their skin, the body sends skin fibroblasts to the injury site to begin contracting the wound while producing proteins and enzymes to break down the damaged tissue and promote healing. 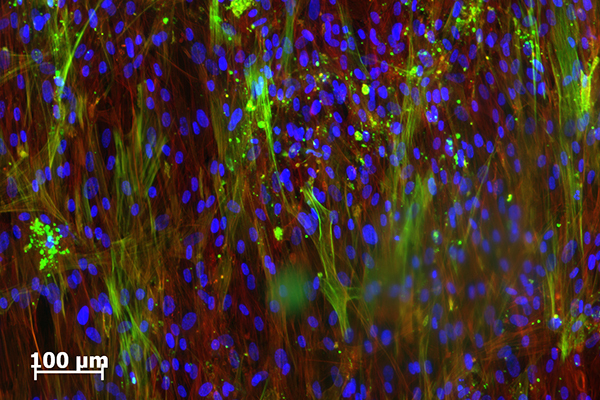 “Fibroblasts are unique in that they can switch from dormant cells to activated wound healing cells when needed. Things become problematic, however, when these cells spontaneously ‘turn on’ for unknown reasons,” she explained. Once in this wound healing state, fibroblasts produce excessive protein and enzymes, break down existing tissue and produce new highly-linked tissue that is stiff and causes perpetual scarring. In the lung, this process can lead to pulmonary fibrosis, loss of tissue function and ultimately death. Kloxin plans to create synthetic hydrogels that mimic the biology of natural lung tissue in the laboratory in order to study why and how these cells sometimes activate. By probing the cells with these materials she hopes to trigger the communication responsible for making the diseased cells activate so that she can investigate ways to prevent this from happening. Kloxin will start by making 3D biomaterial hydrogels with the appropriate extracellular structure. She will then use different wavelengths of light to add or remove bonds to mimic the addition or removal of proteins that occur in tissue. “We’re hoping that using a combination of chemistries and self-assembling building blocks will enable us to capture and map the signals transmitted between cells to better understand the biology of disease, and provide a model for future study,” Kloxin noted. If successful, she believes this information could also lead to promising research on ways to trigger cells to ‘turn on’ when tissue regeneration would be helpful, such as in the case of an anterior cruciate ligament (ACL) or meniscus tear. As part of the grant, Kloxin will develop a comprehensive educational program to reach underrepresented secondary, college and graduate students. She will build an interactive biomaterials and bioengineering kiosk for the Delaware Museum of Natural History, which attracts 75,000 visitors annually, and she is collaborating with Melissa Jurist, UD K-12 Engineering program manager, to create a mini-camp for students in 5-7th grades, formative years that critically impact whether students continue on toward careers in science, technology, engineering and mathematics (STEM). Additionally, she will continue to mentor high school and undergraduate students in her laboratory. April Kloxin joined UD in 2011 as an assistant professor in the Department of Chemical and Biomolecular Engineering. She is a joint faculty member in the Department of Materials Science and Engineering and an affiliated faculty member of biomedical engineering. This winter, Kloxin was a visiting scholar at University of California-Davis, where she lectured and conducted research with medical collaborators investigating cancer and stem cell applications. 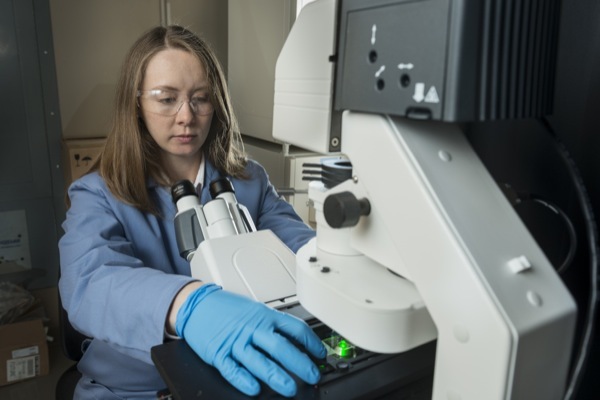 In other work, she is collaborating with Kenneth van Golen, UD associate professor of biological sciences, on research aimed at determining how dormant breast cancer cells become reactivated after treatment and remission. Kloxin earned her bachelor’s and master’s degrees in chemical engineering from North Carolina State University in 2001 and 2004, respectively. She earned her doctoral degree in chemical engineering from the University of Colorado in 2009, where she performed post-doctoral research with the Howard Hughes Medical Institute from 2009-11.